Welcome to my journey as Co-Founder of Little Oak Studio, Inc. 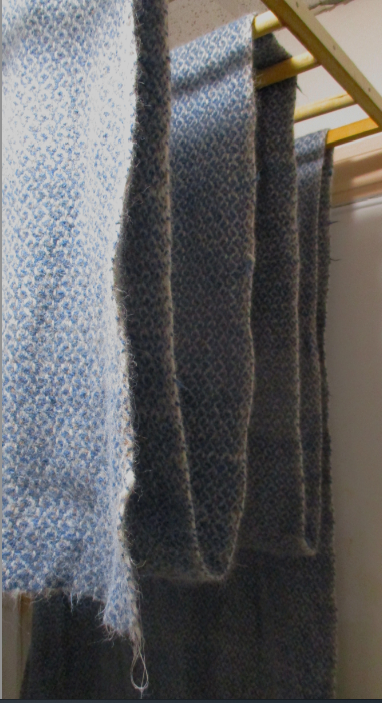 I had the weaver make different color cloths using only one set of warp (long) yarns. 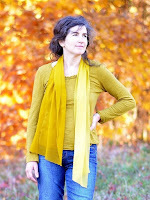 She changed the weft, or crossing yarn's color every few yards. My first step was to separate these different colored fabrics. 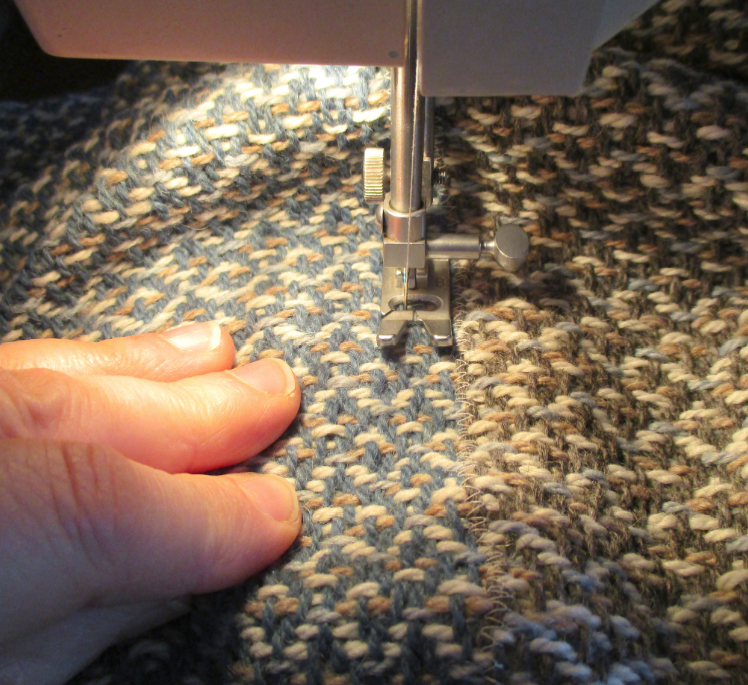 The loose weave makes the fabric impossible to cut without immediate fraying, so the first thing I did was to sew a zig-zag stitch on either side of the transition between colors. 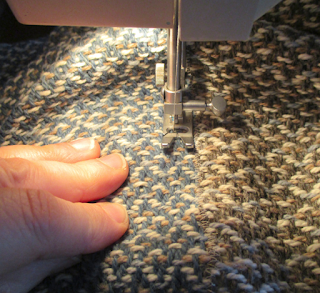 Then I cut between the rows of stitching, without causing any fraying. 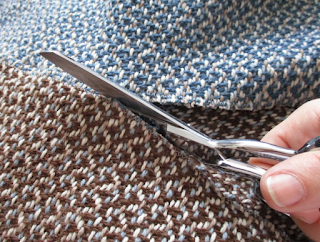 Fulling is the term for shrinking down a fabric - bringing the fibers more tightly together. This makes a stronger, smoother fabric that will last longer, and repel dirt and water better. Once fulled, the cloth can be cut without fraying. In earlier posts I have shown pictures of old fashioned wooden hammers doing this job. Now, many people experiment with their washing machines. I like to process a few yards at a time by hand, using a natural soap solution, so that I can measure the shrinkage as I go. It took about 30 minutes to full these goods by18%. After rinsing in tap water, the cloth is dried - then teased and shorn, before being placed in a bath of hot water for a period of time. 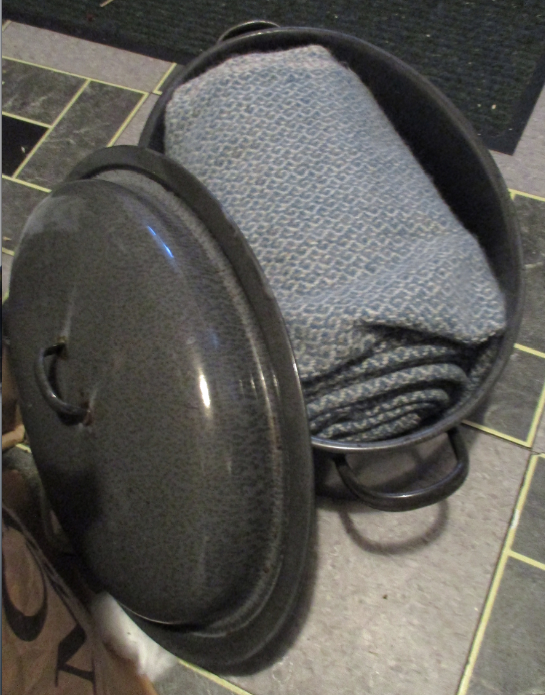 The hot, wet cloth is then pressed to finalize the finishing process I use. Ideally I would have a calender that both presses and wrings out the water from the hot cloth. As it is, I used a hot iron, linens and towels to do the job. The fabric is then hung once more to dry. 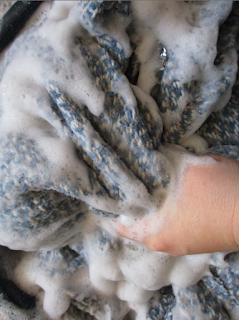 No harsh chemicals were used in any stage of the process, so the wet fabric smells a bit of Alpaca and Sheep. 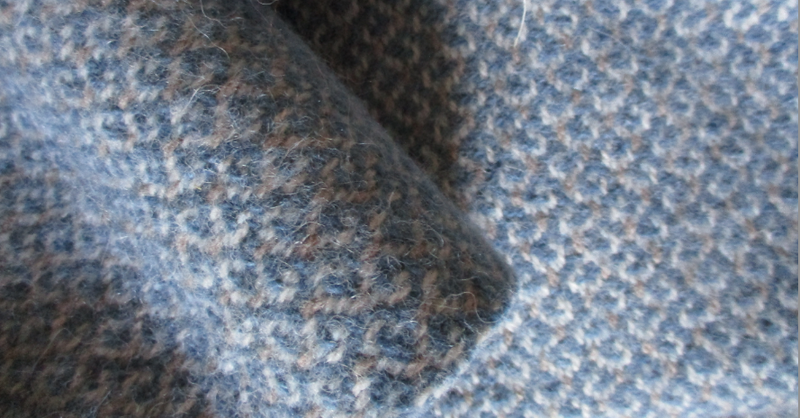 Below, you can see the softer, smoother finished fabric. Because we used "knitting yarn" for this weaving project, the final result is more lofty, and bouncy than if we had used round yarns. Items made from this cloth will be very warm and cozy. Unfinished cloth - Four colors from one warp. 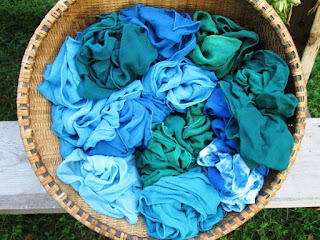 Only one dye was used: Vermont grown Indigo! We are moving towards cloth again! The Vermont indigo crop matured a bit late this year, but we now have two blues to work with. The 3 lbs. of yarn took 25 lbs. of dye plant material. 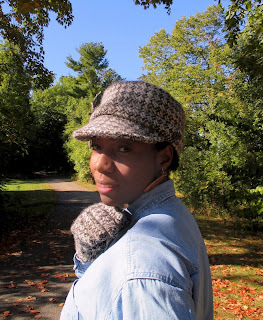 The blue yarns were dried out and added to the earth tones. I then hand cranked all 82 skeins (180 yards each) into balls. You can see the beautiful colors all together here. Last week we delivered them to the weaver. Here are some pictures, including one of the loom on which the cloth will be woven. We are now entering the busiest time of year for weavers in New England, who market their own work. 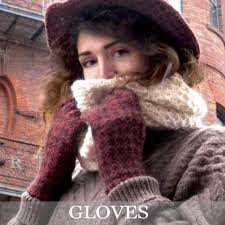 Each state has a wool festival coming up shortly, and then the holiday craft fairs begin. Even so, our weaver may have the 15 yards woven for us by the end of October. Here is to a productive, safe and happy Fall. Our Kickstarter campaign fell flat, but we have gained support to continue, on a smaller scale. The yarn has arrived for a new cloth. The natural alpaca colors are just stunning, and we are excited to see what Vermont grown indigo will look like over the creamy yellow-white yarns. We included some paint chips when we gave our dyer the yarn, but those chips began as pure white, and no bleach will be used on this yarn to make it a bright white. The resulting color may be more of a teal blue. 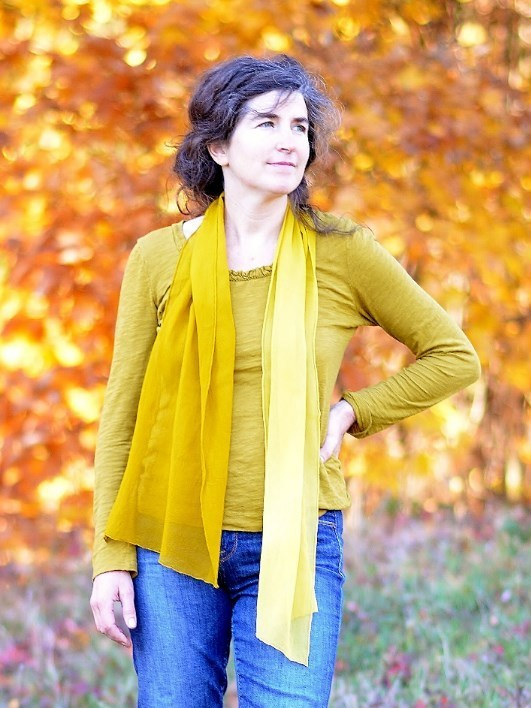 Jennifer Johnson has studied natural dye plant cultivation and processing as well as dyeing processes with diverse fibers. Her studies, both here and abroad, add a rich wisdom to her work as an organic farmer in Vermont. 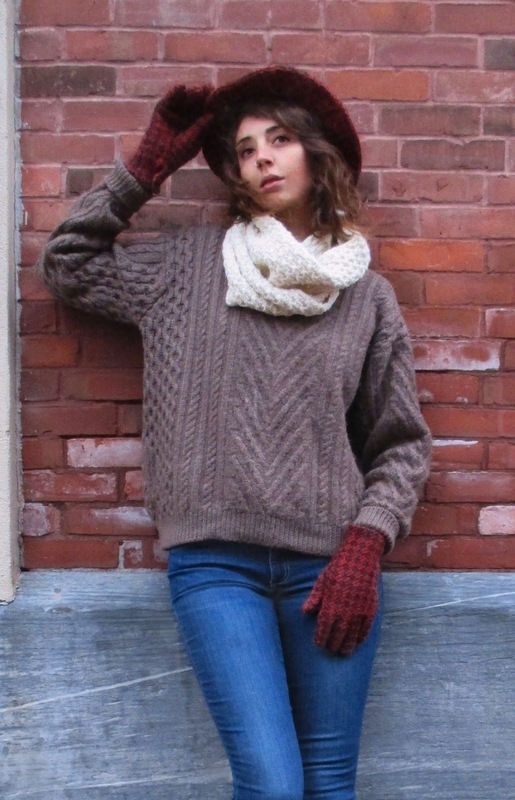 She produced the madder red yarns for Winter Moose in 2015. Below are some results of her work with Vermont grown plants. 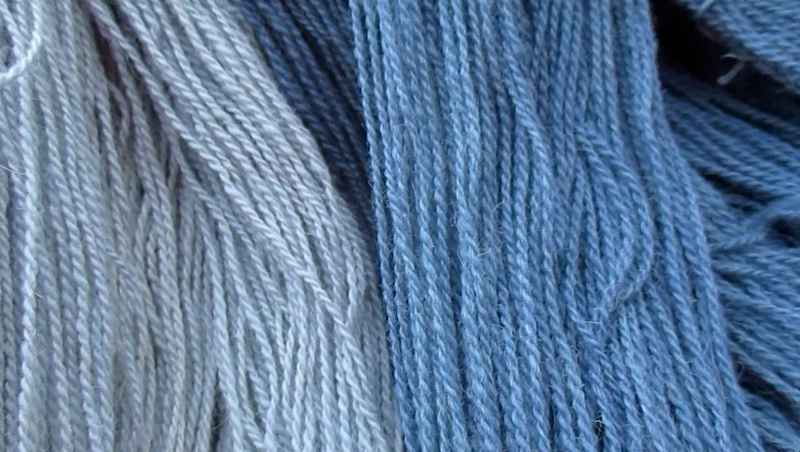 We are excited to see what our yarns will look like in August! 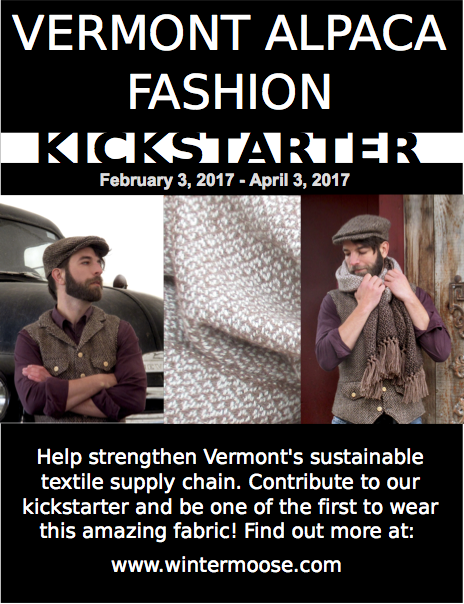 "Winter Moose: Vermont Sustainable Fashion"
Come have a look at the Kickstarter video and all the amazing fabric and fashion items we hope to make for those who contribute to our success. With so much going on in the world right now, we need all the help we can muster to get the word out to those who believe in our work. Thank you in advance for being a part of positive change, and spreading the word about our mission to strengthen Vermont's sustainable textile supply chain. The year is flying by. Over the Summer, I spent a month driving to California and back, making beautiful memories with friends and family on the West Coast. Since then, my time has been split between creating ceramic pieces and developing prototypes and photographs for Winter Moose. 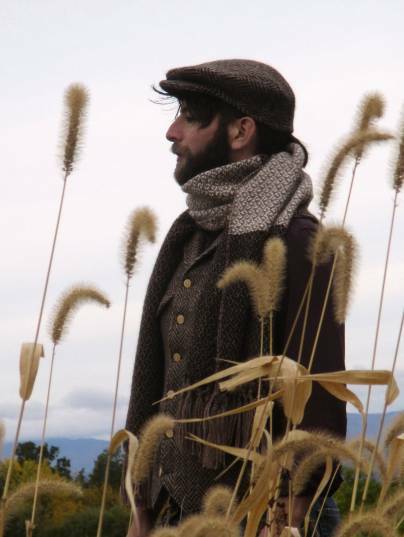 We had a beautiful sample woven for us at the Marshfield School of Weaving, and chose to showcase it as a scarf - adding a fringe. This spiraling vine motif is my favorite crepe pattern weave so far. We continue working with local models, to show our prototypes to advantage. A big "Thank You" to these wonderful community members who enjoy presenting the work of local craftsmen and women - appreciating the values behind all that we do. Now we are ready for the next step. To move Winter Moose out of R & D and into the world of wholesale and retail, we are planning to launch a new Kickstarter. Our hope is to raise enough capital to secure our Winter Moose brand name, and create a small line for retail, featuring 100% Vermont alpaca cloth. We are designing some men's slacks, women's skirts, and button down shirts and scarves for all. A vest and soft caps will also be available. 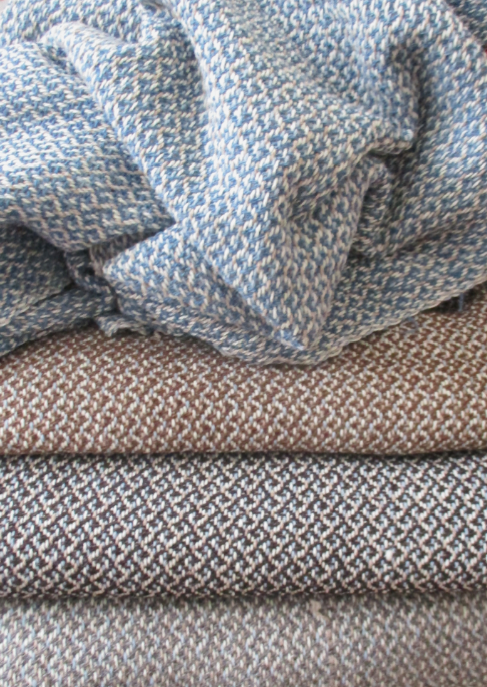 We are very excited about having more fabric woven, more pieces made, and connecting these unique items with future owners. Earlier this month, a friend offered to help us get started on the Kickstarter, with some video footage. Right before the shoot, my new Black and Decker iron died. It was less than 6 months old! I had to get the job done - and I had these old fashioned irons... I had even cleaned them up a little, not imagining that they would come in handy. They worked perfectly! After using them, I am almost ready to keep doing so. We will keep you all posted regarding our Kickstarter Launch Date. We were recently asked, by a fashion blogger, for an interview. Here is a link to the resulting article; our Winter Moose story. It has been a full year, this month, since our Kickstarter fundraiser was successful. We were able to complete our testing goals on two fabric styles, with a few yards to spare. Over the past few months we have made patterns and prototypes, some of which worked, and some of which resulted in humorous references to muppets and Sesame Street. Through trial and error, we have solidified three hat patterns, and a fine glove pattern, all drawn out by hand, in several sizes, the old fashioned way. It took some time to locate an American grown and processed cotton, with no synthetic dyes, fine enough to be a lining for our hats. Our buttons were made to order by a local craftsman, using reclaimed, Vermont grown wood. That took time as well. Slowly, enough items were finished to document and share with the world. I enjoyed capturing our work with photos, as our first two models had fun striking poses against the Burlington architecture. 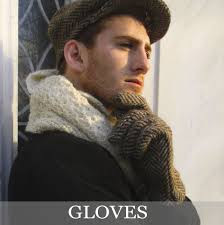 I still have two more hats to finish and photograph, and we will also have another pair of gloves, before we formally announce our presence to the world. 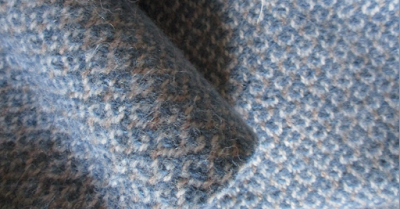 As we keep detailed notes on materials, time and processes used, the real cost of producing these items, from the fiber in the fields through to the finished garment, makes itself evident. In Vermont, we do not have the kind of poorly paid labor pools that are available in the larger cities of America, and of course we do not have the vast numbers of forced laborers, or servile casts that some foreign textile businesses rely on. Hence, our prices will seem, to some, to be on the high end. The other side of the price is our happy conscience, knowing that every sale goes to support small businesses and expert craftspeople in our community. 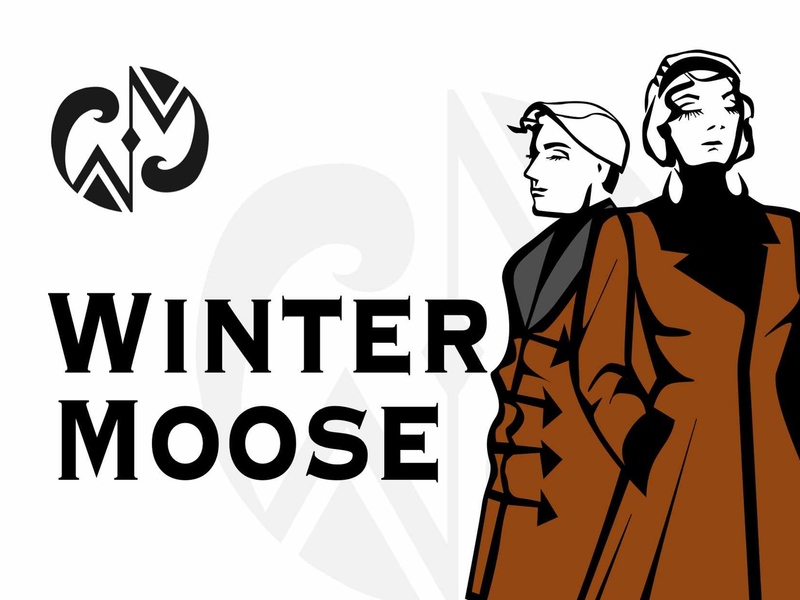 The creation of Winter Moose fashion protects the environment from toxic dyes, and supports healthy people by avoiding all synthetic insecticides and preservatives. Something I have been pondering is the source of power used to create a modern, sustainable fabric. What energy are we using to power the looms, rollers, teasers, stretchers etc. in a mechanized facility? It is true that giant looms have recently returned to the USA - weaving cotton in the South and wool in the North. When these industries thrived here, in the past, economically, water was the main power source. Though the power source was free, the human price was great at the mills. Child labor, injuries, long hours, toxic dyes polluting rivers, health issues from bad air quality, etc. were common. Growing an industry in a way that keeps both environmental and cultural sustainability at the heart while succeeding economically is our challenge. Will we be bringing the water wheels back? In the fall, I took this picture of the old Winooski Woolen Mill that used water as it's power source. This mill is close to my home, but similar buildings dot the landscape of New England. The vast majority of weavers in Vermont use old wooden looms, now. The same kind of weaving that was prevalent in the sixteenth century. We have much to ponder as we move forward.